Our first week of school has come to an end, and so ocean theme week is also ending. It has been interesting to see what LittleMan has responded best to (and worst to) this week. He liked the more independent activities that he could do alone and I could check his work later (like read/build/write and phonics/counting clothes clip cards). He loved daily name journal time- LOVED IT. He was not a fan of anything which required a lot of direction or instruction from me. There were so many little activities and box lessons that I haven’t blogged about, really it is too much to include it all so I’m doing my best to include the favorite activities. 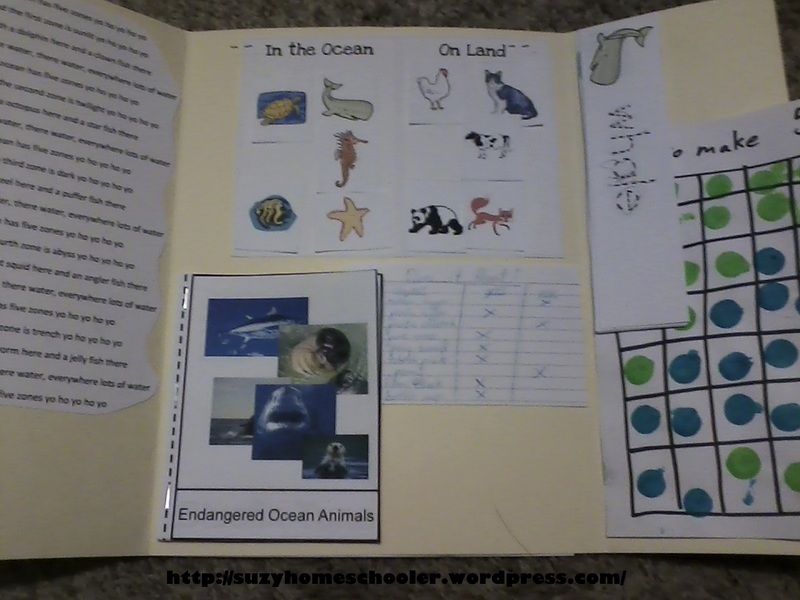 Again, several of our activities have come from Homeschool Creations free ocean preschool printable pack. Today we touched on addition using 5 fish shaped beads I had left over from a project. I drew up a simple addition mat with an index card and some markers. Then I made a chart for LittleMan to record his findings using dot markers. We of course couldn’t end the week without at least one themed snack. 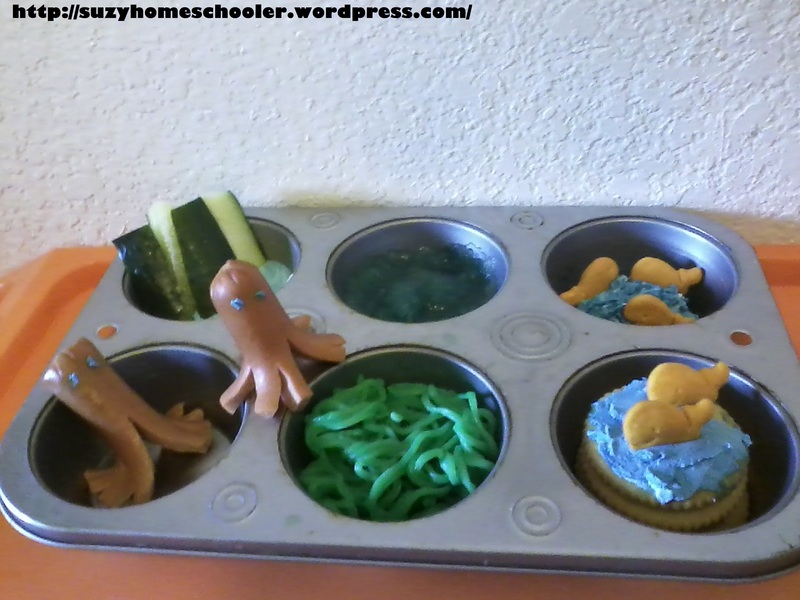 It has been a while since we had a muffin tin meal but it was nice to break out the trays again. Our lapbook isn’t too exciting this week. Inside the left flap is our ocean zone song. On top center is a simple land/sea animal sort from the printable pack I mentioned (and linked) above. Bottom center left are some extra copies of the endangered ocean species nomenclature cards from Montessori Helper, I’ve stapled these extra copies into a booklet. Bottom center right is a little chart that shows the results of our “does it float?” experiment. Inside the right flap top are some traced words, again from Homeschool Creations ocean preschool pack. 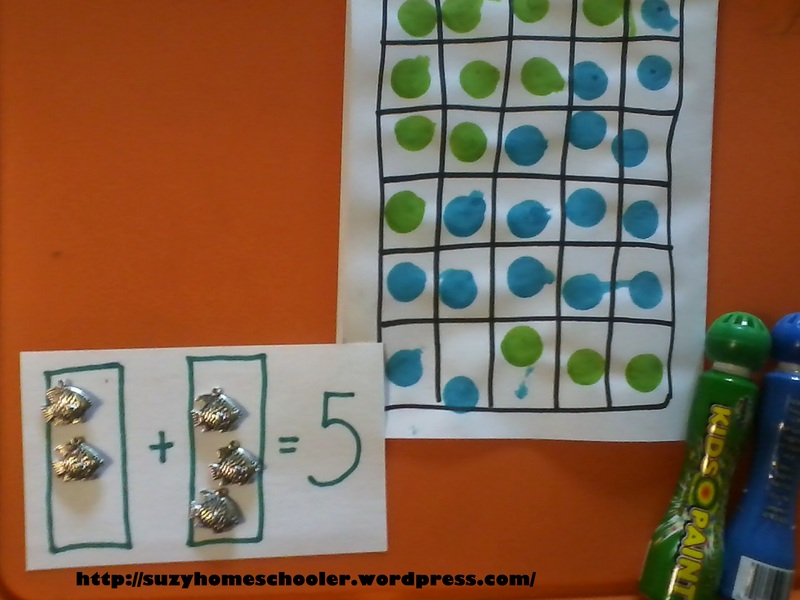 Below those is LittleMan’s addition chart on all the ways to make 5. To the back of the lapbook I stapled all of LittleMan’s loose worksheets including dot-to-dot fish and shark pictures, under the sea coloring pages, ocean vocabulary word/picture matching, etc.. I have 2 days of weekend until our second week of school. Just 2 days to look at how LittleMan responded to activities and lessons then plan our next week according to his learning style. Also just 2 days to try and come up with a better game plan for occupying SunnyGirl while LittleMan does his school work. I can already tell this journey will be a challenging one.